Where w can be any formula returning a numeric value. Where d is the distance between the centerline and the Bollinger Bands in multiples of the standard deviation. Where z is the offset. An offset of 1 would be for one bar ago. Where t is the average type. Leave blank for simple, set to X for exponential, F for front weight, and H for Hull. 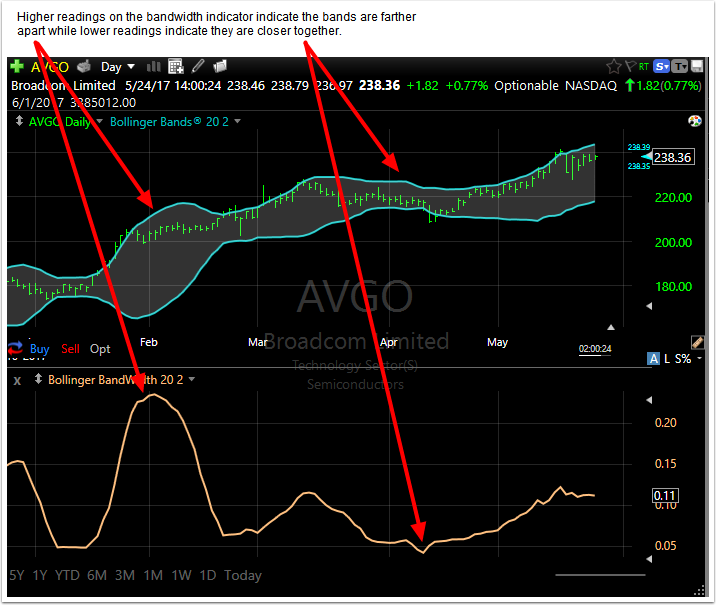 Simple Bollinger BandWidth 20, 2.00 for the current bar can be written as follows. 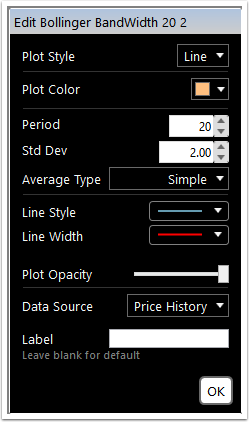 But you can leave out the offset parameters because the current bar is just set to 0. You can also solve the 2 * 2 * portion of the formula to just get 4 * instead. The simple Bollinger BandWidth 50, 2.00 would be the following. Getting the value for the previous bar would involve adding back in the offset parameters. An exponential Bollinger BandWidth 10, 1.5 from 3 bars ago could be written as follows. If you want the value given as a percentage with 0 at the bottom and 100 at the top instead of having 0 at the bottom and 1 at the top, then you would multiply the base formula by 100. So you would use the following for the current front weighted Bollinger Bandwidth 21, 2.5 if you wanted a percentage. Read more about Bollinger Bandwidth at www.BollingerBands.com. Bollinger Bands® are the registered trademark of John Bollinger, who developed them.